PASO ROBLES, Calif. (KFSN) -- Two people are dead Sunday after a rollover crash Paso Robles, the city's police department said. Investigators said a Ford Expedition appeared to run a red light on Highway 46 at Buena Vista Drive and was clipped by a Honda. The driver of the Ford lost control, and the SUV rolled across the highway around 8:30 a.m.
A woman in the Ford was ejected from the SUV and was pronounced dead along with the driver, according to police. 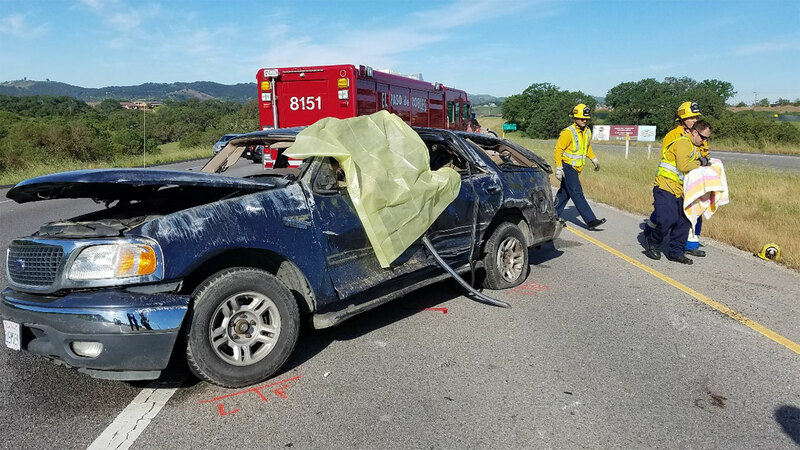 Two others in the Ford and the driver of the Honda were transported to Sierra Vista Hospital in San Luis Obispo and are expected to recover. Police have not identified the victims but say they were from Coalinga. The westbound lanes of the highway were shut down for several hours while police investigated how the crash happened. A small dog in the Ford was taken to a veterinarian for treatment.